Could you be the Child Genius of 2015? 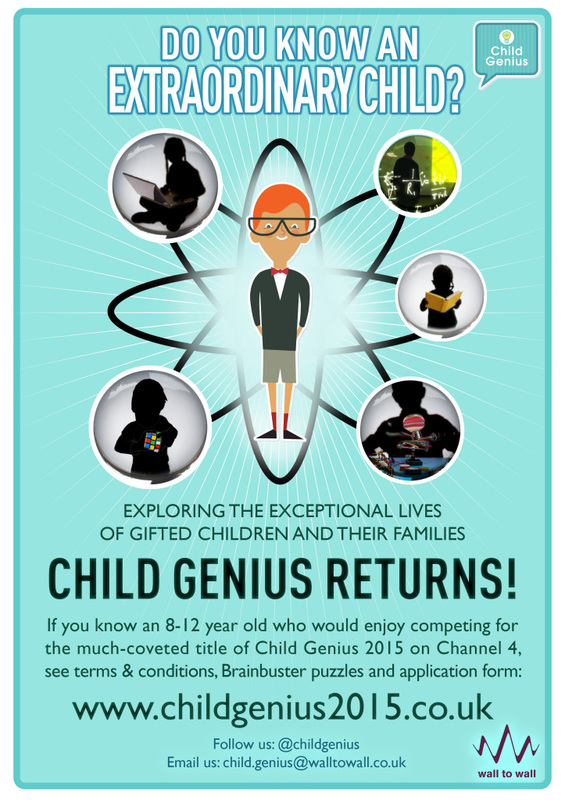 A UK TV series is looking to find Britain’s brainiest children – could it be you? Or do you know an extraordinary child who’d like to take part? Production company Wall to Wall Media is currently searching for more of the country’s brightest young minds to take part in a competition series to be shown on Channel 4. The series will follow a group of children as they battle to be crowned Child Genius 2015 in a competition devised in association with high IQ society British Mensa and other leading children’s education experts. Child Genius will also explore approaches to parenting and education, and what it can mean to be a high-achieving child in Britain today. I’m not up to it but I love watching it! I love watching and want to do it myself but parents won’t let me.